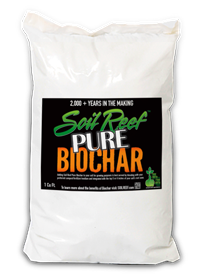 Soil Reef™ Pure Biochar is a premium quality biochar soil enhancement made in the U.S.A. from sustainably produced wood waste and forest residue. At $49.00, including free shipping, our product is an unbeatable $2.12 per pound and a great value for a premium all biochar product. Approximate shipping weight is +/- 25 lbs. A one cubic foot bag of Soil Reef treats up to 48 sq. ft. of garden space. Or mix in your containers, at approximately 3% to 8% by volume of biochar to soil. Our biochar’s particle size is 4mm and less, has a low dust fraction, and is delivered with high moisture content for safety and ease of application. 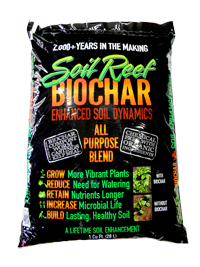 Soil Reef Pure Biochar enhances the productivity of soil and soilless media by acting as a sponge to absorb and release nutrients and water. Soil Reef is useful with manures and composting as well. Feed the soil, and let the soil feed your plants. Because biochar holds onto nutrients, you will want to “pre-charge” your biochar by inoculating it with compost for two weeks first – mixing the biochar with compost and letting them sit, covered, for two weeks. If you do not have your own compost, try Soil Reef’s Gardeners Blend, which is pre-inoculated with compost, worm castings and kelp meal as a ready-to-use product.